Topaz Electric Type T conduit body of trade size 2-inches, provides access to conductors for pulling, slicing and maintenance. It accommodates three conductors of size 2/0-AWG. It features malleable iron construction with zinc-plated aluminum enameled finish. 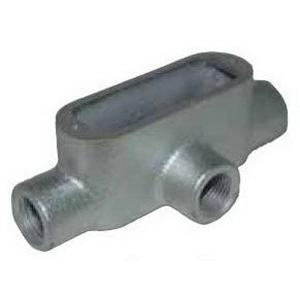 This side access conduit body with NPT connection, has three tee shaped hubs and screw-on type cover. It has 75-Cubic-Inch capacity. This conduit body measures 11.5-Inch x 4.25-Inch x 3.29-Inch. Conduit body is UL/cULus listed and CSA certified.